On Tuesday, February 6, Deree and Pierce students had the opportunity to engage in a discussion with the U.S. 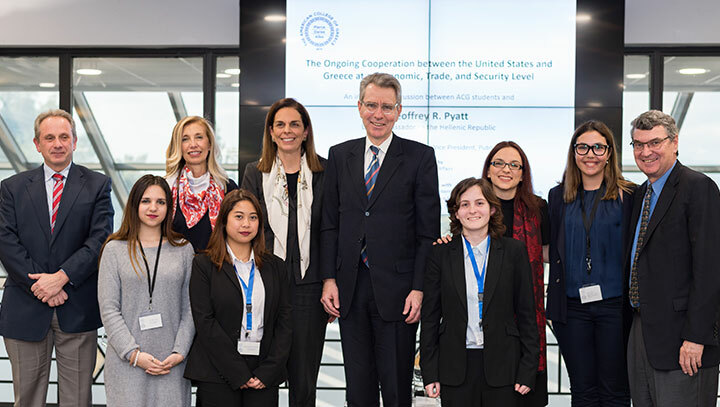 Ambassador to the Hellenic Republic, Mr. Geoffrey R. Pyatt. More than 100 students, faculty and staff gathered at the Upper Level of the John S. Bailey Library to hear the U.S. Ambassador speak about the bilateral relations between Greece and the United States on matters of economy, trade, and security. President Horner addressed the opening remarks and described ACG’s relationship with the U.S. Embassy in Athens as “Our no. 1 institution relationship” before introducing the Ambassador to the audience. “In many ways we are going through one of the most promising phases of U.S.-Greece relations in a very long time” said Ambassador Pyatt on an optimistic note. Commenting on Greece’s great current investment opportunities, the Ambassador stressed the country’s enormous potential in the areas of renewable energy, logistics, digitization, and human capital. In the discussion that followed students asked questions on a variety of topics, including investment opportunities post-crisis, Greece’s relations with Turkey and the neighboring countries, the role of the Greek-American Diaspora, and Greece’s presence as a force of stability and security in the Eastern Mediterranean region. The discussion was moderated by Claudia Carydis, Vice President for Public Affairs, and was organized in collaboration with the School of Business, the School of Liberal Arts and Sciences, the International Honors Society, the Investment Club and the Accounting and Finance Society.